I have two cats -- and all signs suggest that they are two happy cats. This is a good thing, as "not happy" cats are -- well -- "not fun". One thing that keeps kitties happy is a good, tidy litter box. Sometimes, that space may feel like a cat's "home" -- and you will want your cat to feel "at home" in the litter box more than any other place in your house. It is not fun when a cat feels "at home" on -- say -- the living room carpet. The litter box options in this article can help you help your cat feel comfortable when it is "potty time". A lot of Amazon's loyal peeps -- hundreds, in fact -- rate the Litter Robot very high. If you want a litter robot, be prepared to pay more for it than your run-of-the-mill litter box. As litter boxes go, this is the high-tech option, to say the least. If you want an electronic, tidy litter box that looks like a space pod for your cat, then buy the Litter Robot. Perhaps, by saying "popular litter box", I am under-selling this product. 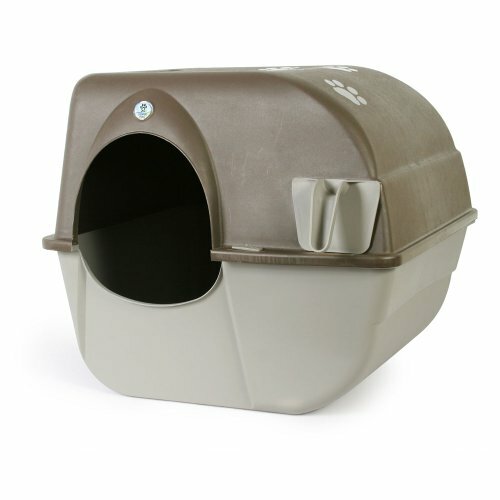 The fact is, online shoppers love this litter box, to the tune of nearly 2,000 positive reviews on Amazon. That is nothing to sneeze, scratch at, nor make any other mediocre cat-related analogy at. The Omega Paw Self-Cleaning Litter Box deserves your consideration. After all, it cleans itself without the use of electricity. Very cool! If your cat is clever, then he deserves a litter box worthy of his wit. 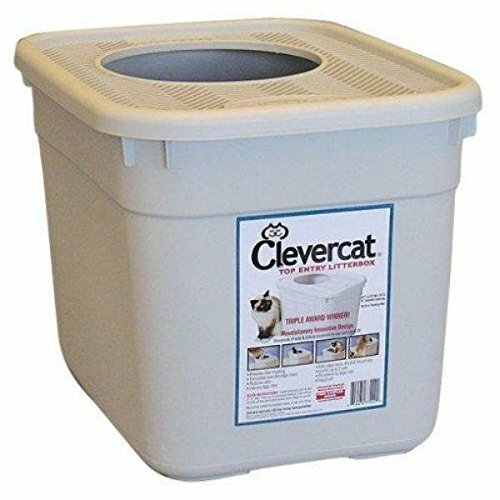 One such option is the CleverCat Litter Box. You will see in the pic to the right that the CleverCat is a box featuring a door on its top. What is so clever about that? If your cat will jump in and use this different sort of litter box, you will notice far less litter scratched out onto your floor. Now, that makes the CleverCat worth a look. As you shop for a litter box for your cat (or cats), you should actually ask yourself a question -- even if you have but one kitty. The answer may surprise, but be sure to ask yourself, "How many litter boxes do I need?" So, how many litter boxes do you need? The answer as per my vet, is the total number of cats in your home plus one. In my case, with two cats, I needed to buy three litter boxes and disperse them throughout my house. The idea here is to give your cats comfort, space, and options. Do that, and you will have happier cats. As a stand-up comedian, I am all for funny products. The Good Pet Stuff Hidden Litter Box is a kick in the pants. It looks like a tree with a planter, but it is actually litter haven with a filter. Inventive! 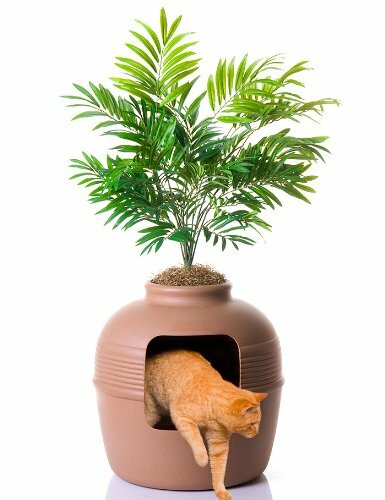 People who have bought this nifty litter box Amazon tend to love it, which means your cat likely will, too. 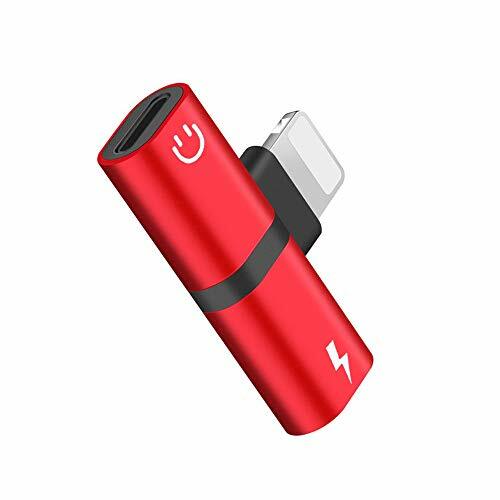 Before you buy it, check out customer reviews here. 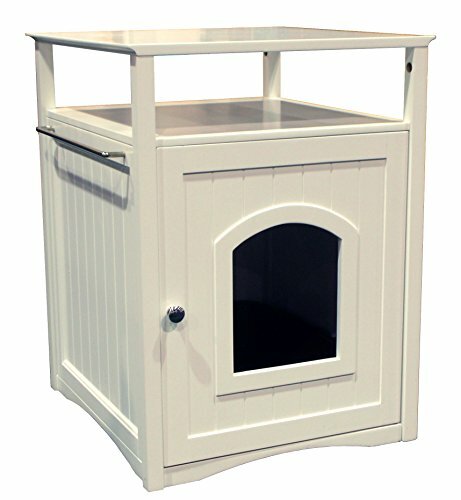 To the right, stands a litter box that offers something useful for both pet and pet owner alike. 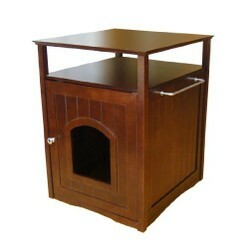 It is the Merry Pet Cat Washroom and Nightstand. You may use it in your bathroom or bedroom. It fits both places well, so long as it matches your decor. 150+ reviewers on Amazon have found it matches theirs, and functions quite well. Buy the Merry Pet if you want a -- well -- merry pet. There are many ways to go with litter boxes. I hope you have found something most accommodating for your kitty here. Great kitty litter box options! Love the versatility!